Early 20th century construction, New York. Image Courtesy of American Memory. About a century has passed since the events at the center of this lesson—the Haymarket Affair, the Homestead Strike, and the Triangle Shirtwaist Factory Fire. For some people in our nation, these incidents illustrated the unfair conditions faced by workers as the United States assumed its position as the most highly industrialized nation in the world. For others, they demonstrated the difficulty of managing industries. Such disagreements continue to this day. Where do we draw the line between acceptable business practices and unacceptable working conditions? Can an industrial—and indeed a post-industrial—economy succeed without taking advantage of those who do the work? Note: This lesson may be taught either as a stand-alone lesson or as a complement to another EDSITEment lesson The Industrial Age in America: Robber Barons and Captains of Industry. Download the Labor Events Chart, available as a PDF. Print out and make an appropriate number of copies of any handouts you plan to use in class. Was the income disparity noted in the two articles the norm? Is great income disparity part of the process when a nation is undergoing rapid economic growth? Is there sufficient evidence to dispel the notion that "the poor were lazy and deserved their fate?" Did the enormous wealth earned by the "captains of industry" eventually benefit everyone through their investments in new factories and their charitable donations? Were workers better off in the Industrial Age than they had been before? Did the benefits of industrialization eventually improve the lot of workers? Did benefits come to workers through the actions of the industrialists or through the efforts of the workers themselves or both? 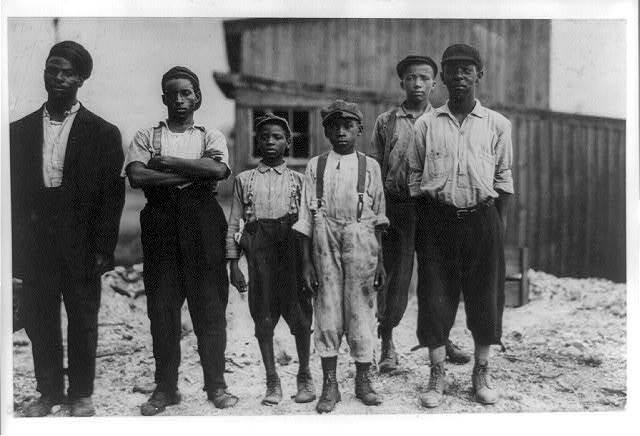 In his report "Child Labor in the Cotton Mills of Mississippi" (1911), Hines noted that he had taken pictures of "most of the youngest workers," as well as older workers under sixteen who worked 60 hours a week instead of 63 1/2, "reduced hours" compared to adults. 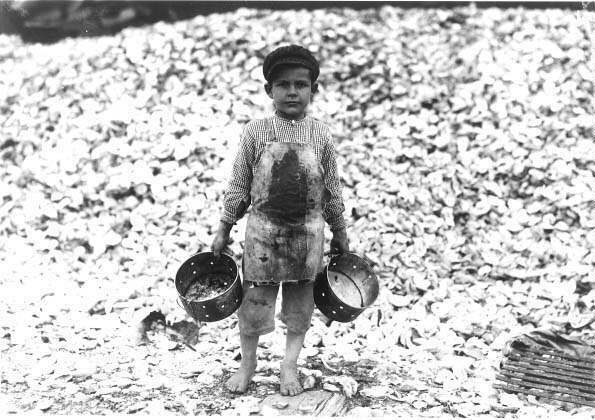 Hine's colleague, Edward F. Brown, in his report "Child Labor in the Gulf Coast" (1913), identified 26 children from ages 7 to 14 (including, for example, six 10-year-olds and five 12-year-olds) working at one oyster factory at 4:45 a.m.
How old are the workers in the pictures? Do the students believe they were able to put in a good day's work? Were they likely paid a fair wage? Why do you think these children and young people were working or allowed to work? Now share with the class both Hine's and Brown's comments regarding these documentary photos, and consider how Hine and Brown might have answered the questions above. After they have read and discussed these comments, ask students to think about their earlier response to Hine's photographs and to consider the following questions: How might Brown and Hine have responded to the same pictures? Why might their responses differ from yours? How does the effect of Hine's photographs compare with that of Riis the Reformer's? Divide the class into three student groups (or six, if you'd like each labor incident to be covered by two groups). Assign one of the historical incidents below to each group. Distribute to the groups the "Labor Events Chart" on page 1 of the PDF. Using the following resources and/or any other approved sources available in your classroom or online, each group should fill in the chart for their assigned individual. It shall be the rule for the workman to be Partner with Capital, the man of affairs giving his business experience, the working man in the mill his mechanical skill, to the company, both owners of the shares and so far equally interested in the success of their joint efforts. The Musical Saga of Homestead "Workers sang during strikes not only to state their beliefs and goals, but because singing helped bind workers together. The Homestead strike of 1892 even had its own Homestead Strike Songster, and the story of the strike can be traced in the lyrics of the following four songs." "I Will Kill Frick": Emma Goldman Recounts the Attempt to Assassinate the Chairman of the Carnegie Steel Company During the: Homestead Strike in 1892 "Known for his uncompromising and cruel tactics, Frick became an obvious target for labor activists looking to make a statement during the protracted strike." Frick's Fracas: Henry Frick Makes His Case "During the 1892 strike at the Homestead Steel Works, plant manager Henry Clay Frick attempted to defeat the strikers forcibly by hiring three hundred armed agents of the notorious Pinkerton Detective Agency. The strikers fought back, and, after casualties and deaths on both sides, the Pinkertons surrendered. In the aftermath of the Pinkerton debacle, Frick spoke with a reporter for the Pittsburgh Post. He laid out his implacable opposition to dealing with the union, his belief that the Pennsylvania governor should send in troops, and his goal of reducing wages at the plant, the central issue in the conflict. Frick argued that the Homestead owners were not allowed to reap the fruits of their investment because of workers' inordinately high wage scales. The union, on the other hand, claimed that the cost of producing steel at Homestead was well below the industry standard, in large measure because the Homestead workers had cooperated in the recent mechanization of the plant." When the groups are finished with their research, have each present its findings to the class. Do students think workers were justified in their actions? Were owners/managers? What lessons can be gleaned from the situations studied? Contrary to what you have heard, sweatshops in third-world countries are a good deal for the people who work in them. Why? Because work, other than slave labor, is an exchange. A worker chooses a particular job because she thinks herself better off in that job than at her next-best alternative. Most of us would regard a low-paying job in Nicaragua or Honduras as a lousy job. But we're not being asked to take those jobs. Those jobs are the best options those workers have, or else they would quit and work elsewhere… sweatshops are a normal step in economic development. Read with—or to—your class the essay The Case for Sweatshops, available via a link from the EDSITEment-reviewed website Digital Classroom. Make sure the students understand the argument offered. Does that argument echo ideas that were stated during any of the labor controversies studied in Activity 2. 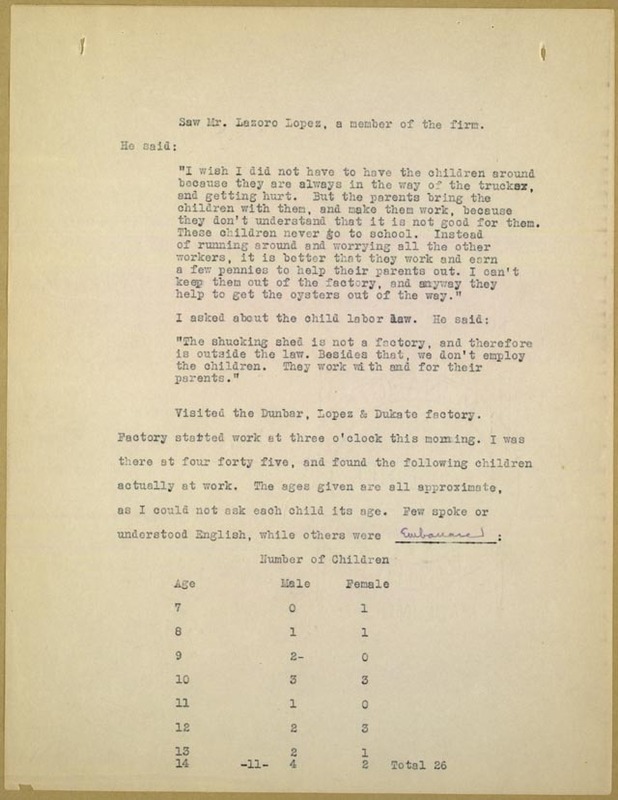 Share with your class the following two documents available through the EDSITEment-reviewed CongressLink: the Washington Post article about sweatshops on U.S. territory and the companies that use them (one of many informative documents from U.S. Congressman George Miller's Information on Sweatshops); and the Garment Enforcement Report October 1995 – March 1996 from the Department of Labor. Students can also read Is It Getting Better? on the Smithsonian National Museum of American History, a link from the EDSITEment resource American Studies at the University of Virginia. 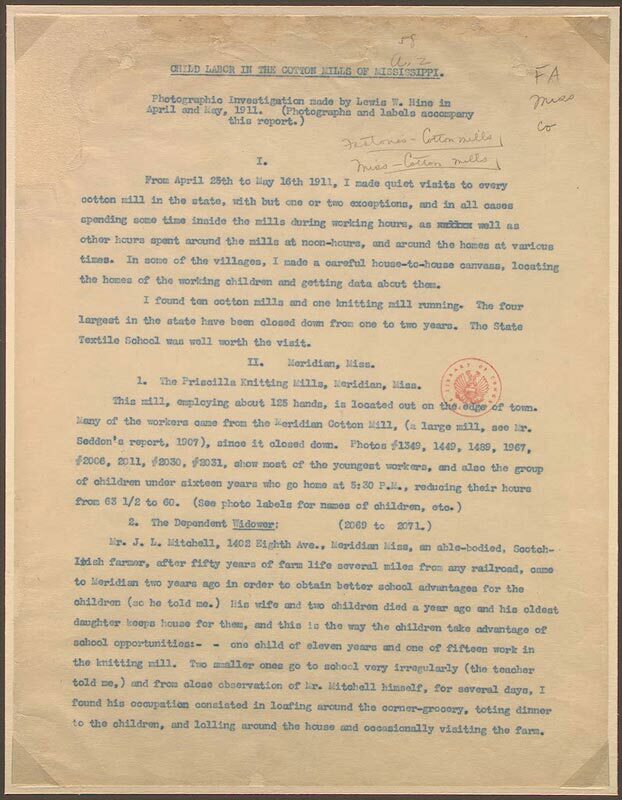 Do these documents echo any ideas that were stated during the labor controversies studied in Activity 2. Sweating the Big Stuff: A Lesson About Labor Conditions Around the World, a partner-reviewed lesson for both middle- and high-school students available on ArtsEdge, and Child Labor in America, on the EDSITEment resource American Memory, may be fruitfully adapted for use in your classroom. How shall we judge the contributions to American society of the great financiers and industrialists at the end of the nineteenth and beginning of the twentieth centuries? In this lesson, students explore a variety of primary historical sources to uncover some of the less honorable deeds as well as the shrewd business moves and highly charitable acts of the great industrialists and financiers, men such as Andrew Carnegie, J. Pierpont Morgan, John D. Rockefeller, and Cornelius Vanderbilt. In this lesson, students explore the First Industrial Revolution in early nineteenth-century America. By reading and comparing first-hand accounts of the lives of workers before the Civil War, students prepare for a series of guided role-playing activities designed to help them make an informed judgment as to whether the changes that took place in manufacturing and distribution during this period are best described as a 'revolution' or as a steady evolution over time. In this lesson, students explore the First Industrial Revolution in early nineteenth-century America. Through simulation activities and the examination of primary historical materials, students learn how changes in the workplace and less expensive goods led to the transformation of American life. List some actions, both positive and negative, of the managers and workers involved in the incidents studied. Discuss the working conditions that led to the Haymarket Affair, the Homestead Strike, and the Triangle Shirtwaist Factory Fire. Discuss the significance of the featured events to the labor movement, the industrialists involved, and the attitude of the American people toward working conditions in the United States. Take a stand on sweatshops today, supported with evidence. What were working conditions like during the Age of Industrialization? How did workers respond to these conditions? Where do we draw the line between acceptable business practices and unacceptable working conditions?